Small gestures make the biggest impressions on Valentine's Day. A personal touch is key; something that reminds the recipient you've taken the time to make something especially for them and them alone. So, if the way to your true love's heart happens to be through their stomach, why not say 'I love you' with an edible gift this Valentine's day? 1. Sift the icing sugar into a mixing bowl, add the butter and vanilla extract and cream together until light and fluffy. 2. Add the flour and salt and blend together with your fingertips until the mix comes together to form a dough. 3. Rest the dough in the fridge for half an hour. 4. Pre-heat oven to 195°C/180°C fan/gas mark 4. 5. Line a large baking tray with non-stick baking parchment. 6. Roll out the dough on a well-floured surface to a thickness of around 5mm. 7. Use the large heart cutter to stamp out the biscuits with a cutter and place onto the prepared baking tray. 8. Re-roll any leftover dough and continue to stamp out hearts until all the dough is used up. 9. Use the small cutter to stamp out hearts in the centre of half of the biscuits for the top biscuit, leave half the biscuits as they are for the base. 10. Return the prepared biscuits to the fridge for 10 minutes to firm up. 11. Bake the biscuits for 10-12 minutes, until they are just beginning to turn golden brown. 12. Allow to cool completely. 13. Place a teaspoonful of jam into the centre of each heart base and sandwich together with the tops. 14. Sprinkle with icing sugar and serve. Use any cutters you have available, if you don't have heart shaped cutters why not try circles? Even an upturned wine glass and the end of a piping nozzle make very handy impromptu cookie cutters! Feel free to use alternative fillings to put your own creative twist on the recipe- lemon curd, cherry jam or apricot jam will all work well. The biscuits will keep in an airtight container for up to 5 days. 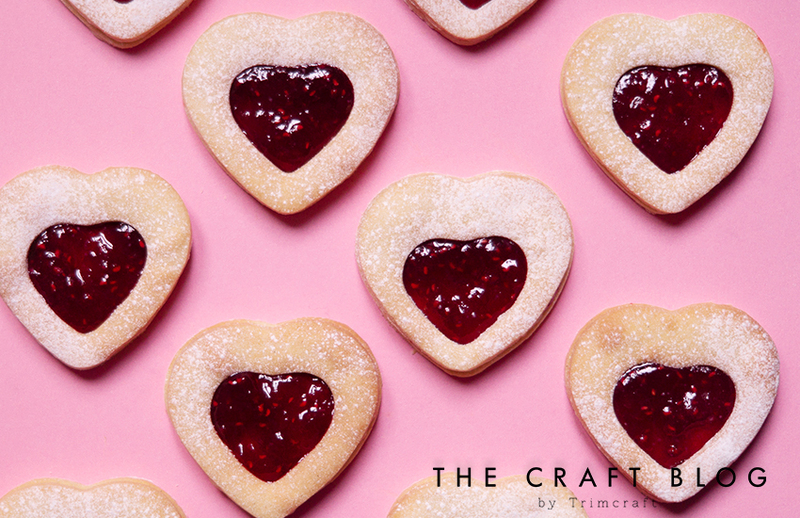 We LOVE these - and we’d love to see how you use Elle’s recipe too, so don’t forget to share your makes in the Inspiration area and to #Trimcraft when uploading to social media!